It looks like the Google+ page for [business name] has not been used in a while. 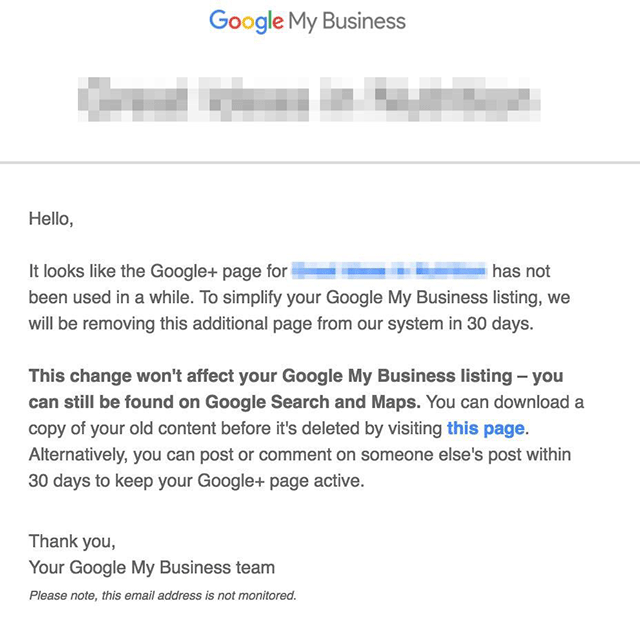 To simplify your Google My Business listing, we will be removing this additional page from our system in 3﻿0 da﻿ys. This change won’t affect your Google My Business listing – you can still be found on Google Search and Maps. You can download a copy of your old content before it’s deleted by visiting this page. Alternatively, you can post or comment on someone else’s post within 3﻿0 days to keep your Google+ page active. I did not get any of these emails yet but I do try to keep up my activity on my Google+ pages. Yes, I am holding out and trying to keep using them even though no one lives there.